As the nature of the school shifted, a new school – Lawrence Sheriff Grammar School – was founded in 1878 to continue Lawrence Sheriff's original intentions. Rugby expanded further in the 20th century and new buildings were built inspired by the Edwardian Era. The Temple Speech Room, named after former headmaster and Archbishop of Canterbury Frederick Temple (1858–69) is now used for whole-School assemblies, speech days, concerts, musicals – and BBC Mastermind. Between the wars, the Memorial Chapel, the Music Schools and a new Sanatorium appeared. In 1975 three girls were admitted into the sixth form, and the first girls’ house opened 3 years later, followed by three more. In 1992, the first 13-year-old girls arrived, and in 1995 Rugby had its first-ever Head Girl, Louise Woolcock, who appeared on the front page of The Times. In September 2003 a last girls’ house was added. Today, total enrolment of day pupils, from forms 4 to 12, numbers around 800. 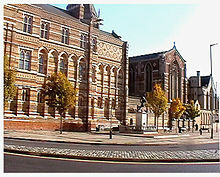 Rugby School was founded in 1567 as a provision in the will of Lawrence Sheriff, who had made his fortune supplying groceries to Queen Elizabeth I of England. Since Lawrence Sheriff lived in Rugby and the neighbouring Brownsover, the school was intended to be a free grammar school for the boys of those towns. Up to 1667, the school remained in comparative obscurity. Its history during that trying period is characterised mainly by a series of lawsuits between the Howkins family (descendants of the founder's sister), who tried to defeat the intentions of the testator, and the masters and trustees, who tried to carry them out. A final decision was handed down in 1667, confirming the findings of a commission in favour of the trust, and henceforth the school maintained a steady growth. "Floreat Rugbeia" is the traditional school song. Pupils beginning Rugby in the F Block (first year) study various subjects. In a pupil's second year (E block), they do nine subjects which are for their GCSEs, this is the same for the D Block (GCSE year). The school then provides standard A-levels in 29 subjects. Students at this stage have the choice of taking three or four subjects and are also offered the opportunity to take an extended project. The Governing Body provides financial benefits with school fees to families unable to afford them. Parents of pupils who are given a Scholarship are capable of obtaining a 10% fee deduction, although more than one scholarship can be awarded to one student. It was no longer desirable to have only local boys attending and the nature of the school shifted, and so a new school – Lawrence Sheriff Grammar School – was founded in 1878 to continue Lawrence Sheriff's original intentions; that school receives a substantial proportion of the endowment income from Lawrence Sheriff's estate every year. The core of the school (which contains School House, featured in Tom Brown's Schooldays) was completed in 1815 and is built around the Old Quad (quadrangle), with its Georgian architecture. Especially notable rooms are the Upper Bench (an intimate space with a book-lined gallery), the Old Hall of School House, and the Old Big School (which makes up one side of the quadrangle and was once the location for teaching all junior pupils). Thomas Hughes (like his fictional hero, Tom Brown) once carved his name on the hands of the school clock, situated on a tower above the Old Quad. The polychromatic school chapel, new quadrangle, Temple Reading Room, Macready Theatre and Gymnasium were designed by well-known Victorian Gothic revival architect William Butterfield in 1875, and the smaller Memorial Chapel was dedicated in 1922. By the twentieth century Rugby expanded and new buildings were built inspired by this Edwardian Era. The Temple Speech Room, named after former headmaster and Archbishop of Canterbury Frederick Temple (1858–69) and now used for whole-School assemblies, speech days, concerts, musicals – and BBC Mastermind. Oak-panelled walls boast the portraits of illustrious alumni, including Neville Chamberlain holding his piece of paper. Between the wars, the Memorial Chapel, the Music Schools and a new Sanatorium appeared. In 2005, Rugby School was one of fifty of the country's leading independent schools found guilty of running an illegal price-fixing cartel allowing them to drive up fees for thousands of parents. Each school was required to pay a nominal penalty of £10,000 and all agreed to make ex-gratia payments totalling three million pounds into a trust designed to benefit pupils who attended the schools during the period in respect of which fee information was shared. However, Mrs Jean Scott, the head of the Independent Schools Council, said that independent schools had always been exempt from anti-cartel rules applied to business, were following a long-established procedure in sharing the information with each other, and that they were unaware of the change to the law (on which they had not been consulted). She wrote to John Vickers, the OFT director-general, saying, "They are not a group of businessmen meeting behind closed doors to fix the price of their products to the disadvantage of the consumer. They are schools that have quite openly continued to follow a long-established practice because they were unaware that the law had changed." Rugby's most famous headmaster was Thomas Arnold, appointed in 1828; he executed many reforms to the school curriculum and administration. Arnold's and the school's reputations were immortalized through Thomas Hughes' book Tom Brown's School Days. David Newsome writes about the new educational methods employed by Arnold in his book, 'Godliness and Good Learning' (Cassell 1961). He calls the morality practised at Arnold's school muscular Christianity. Arnold had three principles: religious and moral principle, gentlemanly conduct and academic performance. Dr George Mosse, former professor of History at the University of Wisconsin-Madison, lectured on Arnold's time at Rugby. According to Mosse, Thomas Arnold created an institution which fused religious and moral principles, gentlemanly conduct, and learning based on self-discipline. These morals were socially enforced through the "Gospel of work." The object of education was to produce "the Christian gentleman," a man with good outward appearance, playful but earnest, industrious, manly, honest, virginal pure, innocent, and responsible. In 1888 the appointment of Marie Bethell Beauclerc by Percival was the first appointment of a female teacher in an English boys' public school and the first time shorthand had been taught in any such school. The shorthand course was popular with one hundred boys in the classes. The game of Rugby football owes its name to the school. 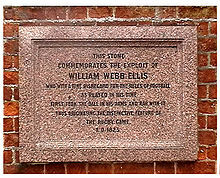 The legend of William Webb Ellis and the origin of the game is commemorated by a plaque. The story has been known to be a myth since it was investigated by the Old Rugbeian Society in 1895. 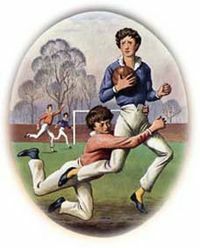 There were no standard rules for football in Webb Ellis's time at Rugby (1816–1825) and most varieties involved carrying the ball. The games played at Rugby were organised by the pupils and not the masters, the rules being a matter of custom and not written down. They were frequently changed and modified with each new intake of students. The sole source of the story is Matthew Bloxam, a former pupil but not a contemporary of Webb Ellis. In October 1876, four years after the death of Webb Ellis, in a letter to the school newspaper The Meteor he quotes an unknown friend relating the story to him. He elaborated on the story four years later in another letter to The Meteor, but shed no further light on its source. Richard Lindon, a boot and shoemaker who had premises across the street from the School's main entrance in Lawrence Sheriff Street, is credited with the invention of the "oval" rugby ball, the rubber inflatable bladder and the brass hand pump. Rugby School has both day and boarding-pupils, the latter in the majority. Originally it was for boys only, but girls have been admitted to the sixth form since 1975. It went fully co-educational in 1992. The school community is divided into houses. There is also a co-educational day house for 11+ admission, called Marshall House. It is smaller than the other main school houses, with around 30 students, and is due to close in September 2018. The Rugbeian Society is for former pupils at the School. An Old Rugbeian is sometimes referred to as an OR. The purposes of the society are to encourage and help Rugbeians in interacting with each other and to strengthen the ties between ORs and the school. In 2010 the Rugbeians reached the semi-finals of the Public Schools' Old Boys' Sevens tournament, hosted by the Old Silhillians to celebrate the 450th anniversary of fellow Warwickshire public school, Solihull School. Rugby Fives is a handball game, similar to squash, played in an enclosed court. It has similarities with Winchester Fives (a form of Wessex Fives) and Eton Fives. It is most commonly believed to be derived from Wessex Fives, a game played by Thomas Arnold, Headmaster of Rugby, who had played Wessex Fives when a boy at Lord Weymouth's Grammar, now Warminster School. The open court of Wessex Fives, built in 1787, is still in existence at Warminster School although it has fallen out of regular use. 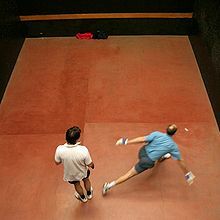 Rugby Fives is played between two players (singles) or between two teams of two players each (doubles), the aim being to hit the ball above a 'bar' across the front wall in such a way that the opposition cannot return it before a second bounce. The ball is slightly larger than a golf ball, leather-coated and hard. Players wear leather padded gloves on both hands, with which they hit the ball. Rugby Fives continues to have a good following with tournaments being run nationwide, presided over by the Rugby Fives Association. ^ "Gabbitas". Retrieved 26 August 2015. ^ "The truth about Flashman: an old Rugbeian writes". The Daily Telegraph. Retrieved 16 October 2015. ^ a b c University of Oxford student. "Rugby School". Retrieved 26 August 2015. Gilman, D. C.; Peck, H. T.; Colby, F. M., eds. (1905). "Rugby School" . New International Encyclopedia (1st ed.). New York: Dodd, Mead. ^ "Education - The Times". Retrieved 26 August 2015. ^ "New Post for Head Master". Archived from the original on 24 September 2015. Retrieved 26 August 2015. ^ "New Head Master Announced". Archived from the original on 24 September 2015. Retrieved 26 August 2015. ^ "richardlindon.com". Archived from the original on 11 March 2007. Retrieved 26 August 2015. ^ "Rugby School - Cotton". Retrieved 28 March 2017. ^ "Rugby School - Kilbracken". Retrieved 28 March 2017. ^ "Walter Gorden Michell Biography". Retrieved 28 March 2017. ^ "Rugby - School Field". Retrieved 28 March 2017. ^ "Rugby School - School House". Retrieved 28 March 2017. ^ "Rugby School - Sheriff". Retrieved 28 March 2017. ^ "Rugby School - Town House". Retrieved 28 March 2017. ^ "Whitelaw". Retrieved 28 March 2017. ^ "Rugby School - Bradley". Retrieved 28 March 2017. ^ "The History of Dean House". Retrieved 28 March 2017. ^ "The History of Griffin House". Retrieved 28 March 2017. ^ "Rugby School - Rupert Brooke". Retrieved 28 March 2017. ^ "Rugby School - Southfield (Day)". Retrieved 28 March 2017. ^ "Rugby School - Stanley". Retrieved 28 March 2017. ^ "Rugby School - Tudor". Retrieved 28 March 2017. ^ "Rugby School - Marshall House". Retrieved 28 March 2017. ^ "Rugby School - The Good Schools Guide". The Good Schools Guide. Retrieved 26 August 2015. ^ "Sir Philip Henry Manson-Bahr". Lives of the fellows : Munk's Roll : Volume VI. Royal College of Physicians of London. Retrieved 3 December 2014. ^ "Obituary Notices: Sir Philip Manson-Bahr, C.M.G., D.S.O., M.A., M.D., F.R.C.P., D.T.M.&H". British Medical Journal. 2 (5525): 1332–1334. 1966. PMC 1944321. PMID 5332525. ^ "Rugby School - (Development Office)". Retrieved 26 August 2015. Hope-Simpson, John Barclay. Rugby Since Arnold: A History of Rugby School from 1842. (1967). Neddam*, Fabrice. "Constructing masculinities under Thomas Arnold of Rugby (1828–1842): gender, educational policy and school life in an early‐Victorian public school." Gender and Education 16.3 (2004): 303-326. Rouse, W.H.D. 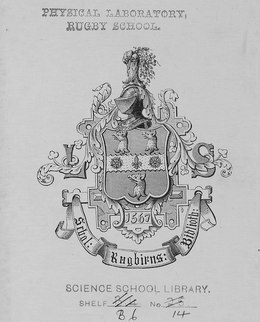 A history of Rugby School (1898) online. Wikimedia Commons has media related to Rugby School.